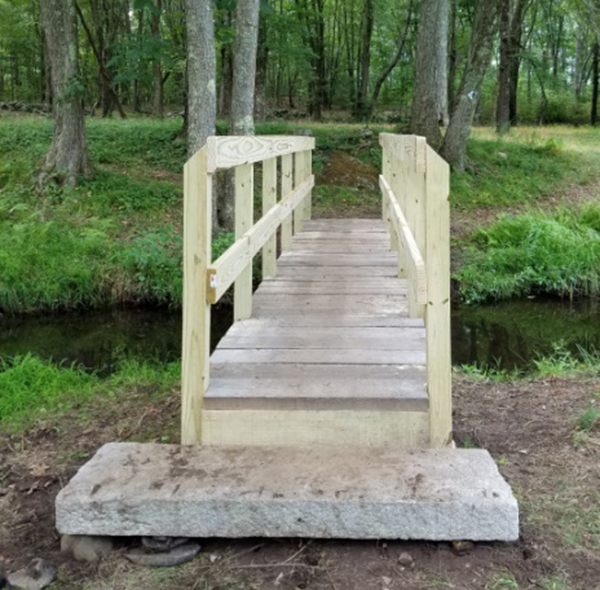 Congratulations to the WCLT Stewardship Committee for a major accomplishment over the summer: the construction of a solid new bridge on the John Malley Trail along Mill Pond (Click here for the Mill Pond trail map.) Over the years, several smaller, previous bridges at the site had been washed out, most recently because of beaver activity. The new bridge is informally known as the Orlando bridge due to its location. In June, July, and August, WCLT volunteers spent three Saturdays constructing the bridge, investing a total of 89 person-hours in the project. 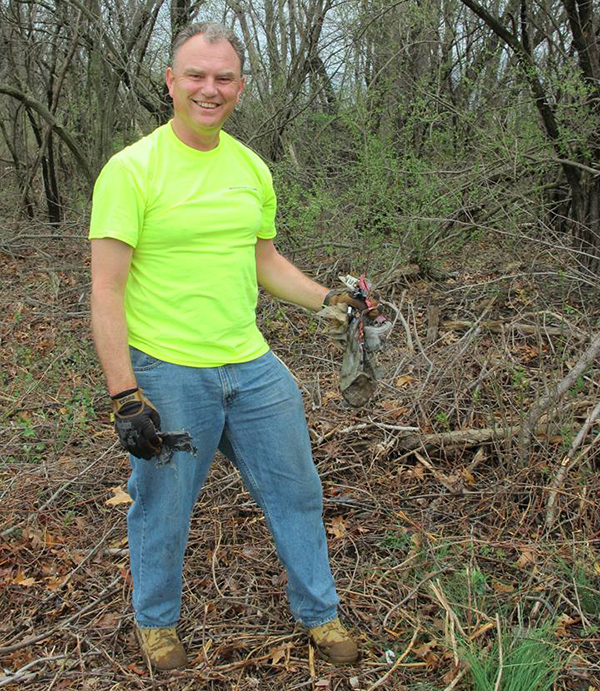 Among those dedicated volunteers were Kevin Johnson, Ethan Steinberg, and Al Sanborn. In addition, Hank Rauch, Jeff Steinberg, and Burt Osterweis spent many hours planning, designing, and purchasing materials. Interested in learning more about how this bridge went up? Look for photos showing various phases of the bridge construction project in a future WCLT e-news – coming soon! WCLT president Scott Shumway opened his Annual Meeting remarks by recognizing the Westborough Community Land Trust’s first Business Partnership with EMSEAL, an international corporation headquartered on Bridle Lane in Westborough. He thanked EMSEAL, along with WCLT member and EMSEAL CEO Lester Hensley, for being founding members of WCLT’s business partnership program. To acquaint members with EMSEAL, Scott noted that the company makes expansion joints, which allow buildings, bridges, and roadways to expand and contract with changes in temperature. Without them, these structures would buckle and collapse. The company also makes seals that keep out the weather while allowing walls and floors to expand and contract. EMSEAL products have been used in the bridge leading to Myrtle Beach SC, the Empire State Building, Fenway Park, UMass Medical Center, Lincoln Center, EMC corporate center, and the El Dorado International Airport in Bogota, Columbia. EMSEAL’s mission and core values of sustainability and preservation align well with WCLT’s mission of preserving, protecting, and promoting the natural environment. EMSEAL has a track record of supporting sustainability and green business practices at home in its Westborough headquarters. In 2012 EMSEAL was certified as a Sustainable Business Leader by the Central Massachusetts Sustainable Business Leader Program™ (SBLP). The company is also a proud member of the US Green Building Council. A highlight of the Annual Meeting is the President’s Award, which recognizes a member who has given exemplary service to WCLT. Kathy Leblanc was honored with the WCLT 2016 President's Award for her dedication to the Education Committee and the HCA Butterfly Garden. In 2001 Kathy created the WCLT Butterfly Garden at the Headwaters Conservation Area (HCA) near the Andrews Street entrance (click here for trail map). It was conceived as a certificate project in Native Plant Studies for the New England Wild Flower Society (click here for Garden-In-The-Woods). It was an interesting and challenging project for a very dry area that was once a pig farm and a gravel pit. The garden was planted primarily with native plants that serve as nectar sources for butterflies or as host plants for butterfly eggs and caterpillars. Some of Kathy’s other volunteer activities include serving on the Westborough Cultural Council and taking part in the Congregational Church choir and hand bell choir. Kathy had a career as a programmer, analyst, and software engineer for 30 years, retiring from Raytheon Company. In retirement she has kept in shape, doing five triathlons – one in Florida and four in Massachusetts (in 2007, 2008, and 2009 at ages 68, 69 and 70). 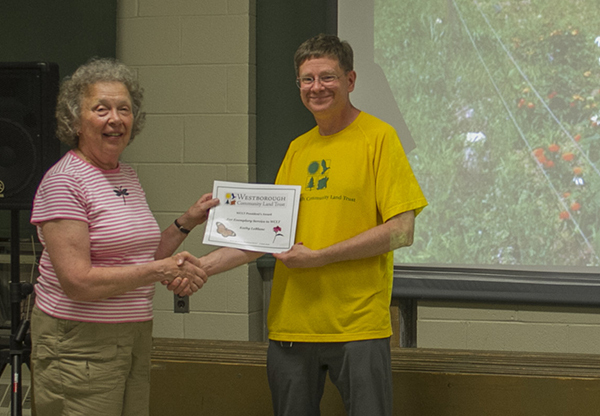 WCLT thanks Kathy for her dedication and work on behalf of WCLT and the Butterfly Garden project, providing an example of the long-term commitment that conservation efforts and nature projects need in order to succeed. The presentation of the Pepper Award is always one of the best parts of WCLT’s Annual Meeting in June. “It’s a pleasure to present the 2016 Pepper Award to Girl Scout Troops 11130, 11129, 30507, and 30633 for their contributions to the mission of WCLT and for the Bronze, Silver, and Gold projects recently completed by their scouts,” said WCLT president Scott Shumway upon presenting the award. The Ellie and Jack Pepper Award is given to an individual or organization for outstanding work in conservation and land preservation benefiting WCLT and the citizens of Westborough. The Girl Scouts’ contributions included two recent Gold Award projects. In 2016, Hayley McCloud, Troop 30633 (led by Judy Wilchynski), created a website to guide children and their parents hiking at Bowman Conservation Area. In 2015, Margaret Baldwin (Troop 30633) developed a phone app that provides a guided nature tour on the trails around Gilmore Pond. Girls from Troop 30507 (led by Karen Yeowell) contributed through their Silver Award projects. Ella Fox and Corinne Sciarappa gave WCLT’s trailhead kiosks a facelift with new photos and information. Greta Feldman and Grace Desmond re-blazed trails. Lydia O’Connell installed “You are here” maps at various trail locations. Two Bronze Award projects also benefited WCLT. The scouts of Troop 11130 (led by Michelle Scerbin and Jessica Fox) created the video “Get Charmed on the Charm Bracelet” as a public service announcement for Westborough TV. Troop 11129 (led by Katie Northrup) worked with WCLT members to plant wildflowers along the trail surrounding Gilmore Pond. WCLT thanks all of these Girl Scouts for their accomplishments in improving and promoting the trails and open space areas in Westborough. The Boy Scout troops of Westborough (Troops 4, 100, and 382) were rewarded with WCLT’s 2012 Pepper Award for their work on behalf of WCLT, performed through Eagle projects and other troop projects. On April 9, WCLT will celebrate its 20th Anniversary with a Wine Tasting at Arturo's Ristorante! Julio's Liquors will be on hand to pour a variety of wines; Arturo's will feed us well with hors d'oeuvres; a special 20th anniversary commemorative gift for all; and plenty more! More details to follow as we finalize this special event! 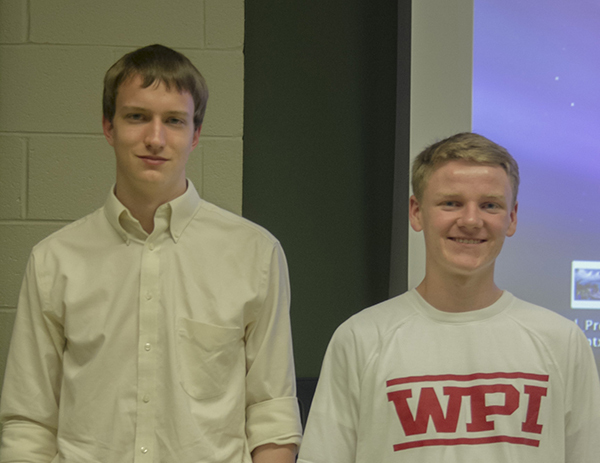 Congratulations to the recipients of the 2016 WCLT Scholarships, Westborough High School graduating seniors Ben Anderson and Owen Smallcomb, who were recognized with a hearty round of applause at the Annual Meeting. The two scholarships of $1,000 each were awarded on the basis of essays submitted in WCLT’s Earth Day Essay Contest, which runs every year in March. The winning essays are available to read on the WCLT web site. Ben wrote about Lake Chauncy. Westborough Cultural Council (click here), Westborough Newcomers Club, (click here) and Knights of Columbus (click here) for their key support of WCLT’s 2016 live animal program in February, “Snakes of Massachusetts and the World” by Rick Roth of the Cape Ann Vernal Pond Team. The event was part of WCLT’s effort to connect children and their families with nature. Willows at Westborough (click here) for choosing WCLT as the nonprofit organization that greeted the public and benefited from donations at the free outdoor Willows concert featuring The Reminisants in August 2016. Westborough Civic Club (click here) for a grant that helped to support WCLT’s Bowman Discovery Day in September 2015 celebrating the Bowman Conservation Area. The Civic Club was able to make this donation thanks to its successful Christmas tree selling seasons. Copyright © 2016, Westborough Community Land Trust, All rights reserved.